If you’ve been looking out for sales for some of your household appliances, Black Friday is perhaps one of the best times to buy. 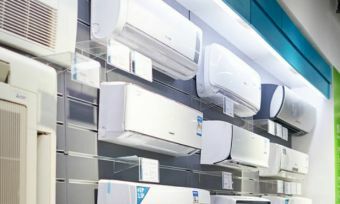 David Jones is offering some hefty bargains on fridges, washing machines and dryers. So, if you’re in need of something new, read on for all the details. For a large family, you might like to consider this 519L French door model from Fisher & Paykel. It’s equipped with a bottom freezer drawer, ice and water dispenser, plus anti-fingerprint coating and spill-safe secure glass shelves to capture any drips or leaks. It’s boasted for Fisher & Paykel’s ActiveSmart technology stated to help keep food fresher for longer by adjusting airflow every time you open the fridge. It has a 3.5-star energy efficiency rating, using 414 kWh/year. Size dimensions are 1715mm (H) x 79mm (W) x 695mm (D). If your household isn’t as big then this 341L top mount fridge from Samsung might suffice. It features a ‘Twin Cooling Plus’ system – separate cooling evaporator for the fridge and freezer. Its ‘Smart Conversion Mode’ is stated to turn your freezer into a fridge for additional capacity. In addition, you’ll find double door bins, LED lighting, twist tray ice maker and a deodoriser system. Similar to the Fisher & Paykel model, this fridge has a 3.5-star energy efficiency rating with dimensions of 1715mm (H) x 600mm (W). 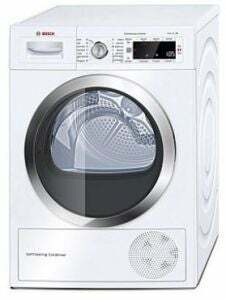 This 8kg front load washing machine features a new design from Bosch, plus an EcoSilence Drive for quiet operation. It’s designed with Bosch’s Active Water Plus system (stated to be a resource efficient water management system) and has an ‘EcoPerfect’ program that uses just 57L of water per wash. In turn, you can expect five stars for water efficiency and four stars for energy. Other programs include Cotton, Easy Care, Delicates, Super Quick 15 and Allergy Plus. You’ll also find a time delay feature that lets you set the load for when you get home from work (up to 24 hours). Dimensions are 84.5 cm x 60 cm x 59 cm. Heat pump dryers are generally the most energy efficient kind of dryer that you can buy and for more than half the price you can score this 9kg heat pump dryer from Bosch this Black Friday. 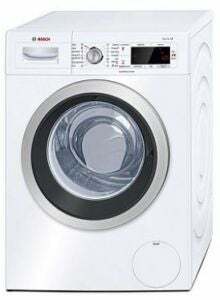 It has a six-star energy efficiency rating, plus features ActiveAir Technology and Sensor drying that automatically stops the drying cycle once the load is completed. Programs include Wool, Mixed Load, Super Quick 40 and Allergy Plus. There’s also a time delay start option and child lock for safety. Dimensions are 84.2 cm x 59.8 cm x 65.2 cm.